LinkedIn app for Windows 10 is now officially in Windows Store. The new app provides a more engaging and fully integrated LinkedIn experience that is quickly accessible from Start menu and taskbar. The app also delivers real-time notifications, including new messages, insights on who you’re meeting with next, trending news in your industry, and timely updates on your network in the Action Center and Live Tile. The new LinkedIn app for Windows 10 gives you full control over the types of updates. The Windows 10 Action Center will serve as your hub for LinkedIn updates about you, your content, and your connections. You can manage which updates you’d like to receive in the Action Center directly from the Notifications tab inside the app. 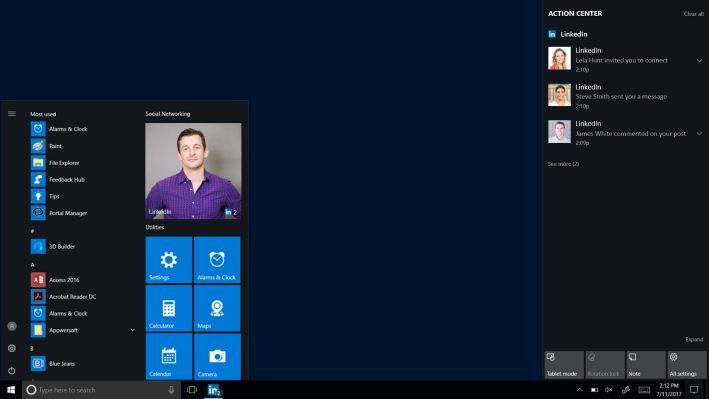 LinkedIn app for Windows 10 Action Center and Live Tile. The app will launch in 22 languages (English, German, French, Spanish, Portuguese, Chinese (simplified), Arabic, Danish, Italian, Dutch, Japanese, Korean, Norwegian, Polish, Turkish, Swedish, Chinese (traditional), Czech, Indonesian, Thai, Malay, Romanian). You can now download the LinkedIn app for Windows 10. The company will gradually roll out the app globally by the end of July.